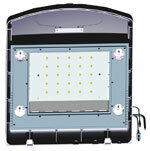 The 28G Nano Cube LED model is the latest release by JBJ. Part of the popular Nano Cube Series, the 28g Nano Cube LED employs a high intensity LED illumination system which delivers both the power of Metal Halides and the coverage of T5 lighting. The distinct advantages of the LED model is 10x the light bulb lifespan, lower energy consumption, and cool running. Sick of buying new bulbs? How about once every 10 years!! 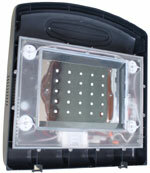 The 89 watt LED system in this 28g Nano Cube outputs PAR comparable to that of the 150W HQI – 14K model, while consuming approximately 40% less energy. LEDs radiate heat upwards, rather then downwards, and therefore reduce heat transfer and the all-to-common need for a chiller. To ensure cool running (Not the movie!) JBJ employed an aluminum heat sink, which quickly dissipates the heat put out by the LEDs. 4 cooling fans are turned on in unison with the lighting, and a thermal protector has been added with an auto shut off feature, in case the fans fail. 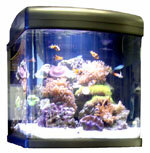 A common modification of the all-in-one nano tanks is the implementation of a refugium. JBJ makes everything easy as pie by providing a dedicated chamber for macro algae, alongside the activated carbon and sponge. The sponge helps prevent the algae from reaching and clogging the return pump. The redesigned Ocean Pulse Duo now uses a memory chip to ensure consistent performance, even after a power failure. The Ocean Pulse Duo provides variable flow. Increments can be set anywhere between 10 seconds to 6 minutes in alternating cycles.